Another subfloor thread - BuildingHomes.ca - Building your community! Lowe's is having a buy more save more sale this weekend so I'm thinking of buying the subfloor panels for my basement reno which will begin shortly. I'm leaning towards the Barricade with XPS insulation but considering Dricore for the cost savings. I like the barricade for the insulation factor plus the sound deadening qualities. Does anyone have any experience with either and what are your thoughts on the sound transfer with Dricore? It seems HD and Lowe's have a lock on these products and the prices never come down. I used the Barricade tiles in my basement. They were installed about a year ago (or maybe more), so they were a little different than the tiles they sell now. The new Barricade tiles have more grooves for air-flow. Anyway, our carpet went in a few weeks ago and we've been using the room ever since during some really big cold snaps (e.g. -20C). Through it all the basement has been toasty warm. In fact, we had a neighborhood gathering last weekend and people were taking off their sweaters. Now, we have spray foam down there as well, but when you go from the finished area to the furnace room where there are no tiles, the cold concrete becomes apparent pretty fast. I chose Barricade because the foam underneath each tile has an actual R value (I think maybe 2 or 3?) while the Dricore has no R-value. I figured 2 or 3 is better than none. Also, no matter how well your basement floor was poured, there WILL be spots that aren't level and that will make the panels a bit uneven in a few areas. I also chose the Barricade because a friend of mine used Dricore and there are a few places where you can hear his floor "click" as you walk over it. It's not a huge deal, but my floor is a lot quieter simply due to the fact it's lined with foam underneath. So yah, Barricade has worked awesome for us. I'd never do another basement without it. Last edited by TheGrudge; 2015-01-30 at 01:50 PM. What will the finished floor be? Not certain what the finished floor will be - likely Vinyl Plank flooring. I called Ovrx, the manufacturer of Barricade, and they told me that Dricore purchased the company. Probably the reason why Dricore now sells the tiles with XPS. I'm mid-basement renovation. I'm using DryBarrier tiles. I'm really liking these. Primarily because they contain no osb or any other material that can support mold. They're about 3/8" thick as well, so transitions to other floors are less pronounced. It is sort of like Delta FL but with a soft foam to eliminate the click and clack of the Delta membrane on concrete and it has a R 2.24 value. Best of all it is very light weight and comes in rolls that are very easy to cut using a utility knife. All of these look like great products and much less expensive. I have considered Delta-FL before but I have one problem. I can't get a 4x8 sheet of plywood into the basement. I have two 90 degree turns going down which hinders my ability to get the sheets down. The plan includes a washroom, and laundry which means tile which means I need the plywood. I also don't like the idea of drilling hundreds of concrete screws into the concrete. How are the Barricade or Dricore R+ panels leveled? A laminate on membrane option is much simpler and cost effective than all these other options. I think about this stuff way too much. From what I've seen, your options are a rolled subfloor product, or a tiled subfloor product. I've used DeltaFL in one basement. It does produce a clicking noise when you walk over low spots. One option there is to use landscape fabric to reduce the clicking, but that will interfere a bit with the ventilation below the subfloor. It runs a little more that $0.60 per sq.ft., plus landscape fabric. If you use DeltaFL, use landscape fabric. The clicking is annoying. DMX 1-Step uses some foam on the underside of the dimpled membrane, eliminating the need for landscape fabric to avoid clicking. It's about $0.80/sq.ft., but probably worth the extra over DeltaFL, to me. Some people use cheaper Platon or DeltaMS, which are meant for exterior use against foundation walls for drainage. The plastic content in the stuff meant for indoor use is probably a safer bet. Platon is also really soft. With any rolled subfloor product, you need laminate foam ($0.25 and up per sq.ft.) below laminate or engineered hardwood flooring, or 5/8" t&g plywood ($1/sq.ft.) or osb ($0.50/sq.ft.) sheathing, plus about $0.25 per sq.ft. for 15 tapcons per sheet, if you're using carpet. Total subfloor height is either 3/8" for laminate or almost 1" for plywood/osb. With these rolled subfloor products, you get a nice vapour barrier. You have to watch with laminate foam that you don't create two vapour barriers and possibly trap moisture between them. I'm really not a fan of Dricore. 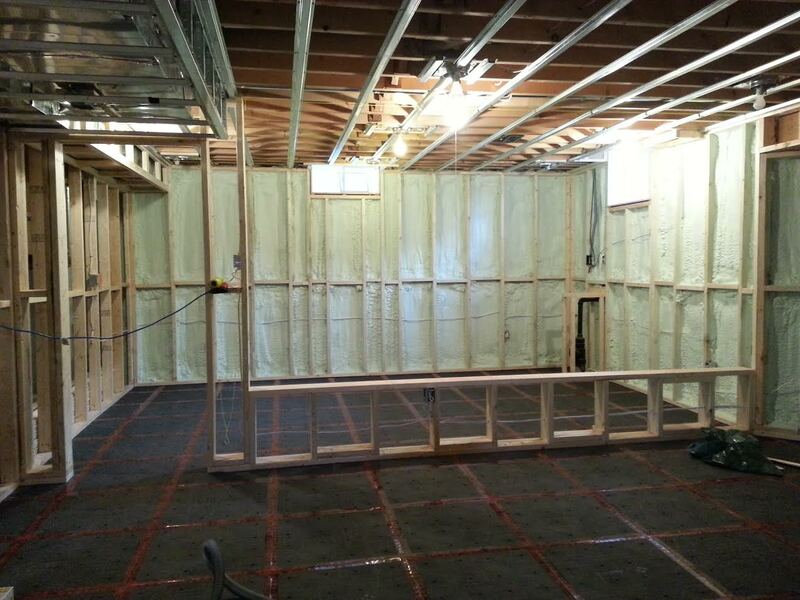 It is not a vapour barrier, because the plastic sheets or rigid foam boards don't seal (there's actually about a 1/4" gap between them once assembled), and then there's the osb, which is always a concern for swelling or mold growth in basements. And for this, you pay quite the premium - $1.80/sq.ft. for the regular 7/8" panels, or $2/sq.ft. for the 1" thick insulated panels, that also have the gaps between the rigid foam boards. If you were applying rigid foam to a wall, you use canned foam to seal the gap between the foam sheets. I don't see how you can with Dricore R+. To me, the best system was going to be DeltaFL or DMX, plus 5/8" osb, though I was leaning plywood because I don't like osb for floors. I paid for plywood floors in my house. That system, ready for carpet, was going to run me about $1.50/sq.ft., for a system that would have been almost 1" thick. Transitions to concrete floors would have been a awkward, as the carpet would have added to the height, so the step would have been around 1 1/2". I know I'll sound like a fanboy, but the DryBarrier tiles solve a lot of these problems. First, there is no osb or wood products in them. They are 3/8" thick, and rubberized "thermoplastic". It's supposed to be post-industrial recycled material. I can't smell it, unlike DeltaMS which is meant for exterior use. DryBarrier clicks together, and the system has some play built-in so you can slide one tile up to 1/2" offset from the last. Once it's down, you put a tapcon in the corners of the room, tape the joints with red Tuck Tape, and that's your vapour barrier and subfloor done. You can install carpet directly on top of it, without osb or plywood. And because DriBarrier is a soft plastic, you can install laminate or engineered hardwood directly on top of it as well, no laminate foam. It cuts with a sharp knife in 1 pass, if you avoid the dimples. 2 or three passes gets you through the dimples. Because a lot of the cuts were the same, I used a table saw, as I'm sure a lot of people do for Dricore as well. DryBarrier is sold in cases of 8 sheets, and at $1.87/sq.ft., is about the cost of Dricore, but a full 1/2" thinner, and it's your vapour barrier. The main problem is they are not widely available yet. This basement is one of the first to use it. There is only one store in Vaughan that sells them at the moment. Last edited by BartBandy; 2015-02-03 at 05:21 PM.